Crossfit Open 15.2 in the books! Well another Friday night light success ! so many incredible accomplishments happened! limits were exceeded, we had a bunch of first pull ups and so many did better than the year before! We as coaches and friends are so proud of everyone who comes to class and puts their best foot forward. Its amazing to see you come together and cheer each other on and support one another when things may seem impossible. It’s a family that I need in my life and I hope you feel the same! Since we have gone another week without a costume prize, I am challenging the coaches to get dressed up next week to lead the charge! This amazing lady, fought for every pull up and we could hear the cheers every time she reached the top of the bar. like most of you who got some pull ups in, these were Linda’s first! and she got 3! It was an incredible performance! Congrats Linda, you can choose between a pair of Biion Shoes or $100 gift card to idols and anchor tattoos. Although this is always impossible to choose as everyone who takes on a wod at crossfit Indestri could get this award, this week we chose 2 guys who helped each other fight through the work out. They pushed each other even though they may have not had as much time as they would like in the box due to life getting in the way, they showed up and battled together. You may have stopped to watch this performance as you could feel the respect these 2 have for one and other as they chipped away at 15.2. This week the performance goes to Chuck Mesley & Mike Jackson, well done boys! You both will get a prize pack from Hustle Originals. So many accomplished feats of fitness happened this week! Keep up the great work and lets see what next week has in the hopper for us. We will be getting some Ript skin system pack in the gym this week. I swear by them and in over 2 years have not ripped the skin on my hands. they are a preventative plus repair kit for ripped skin on your hands. check them out, feel free to ask me any questions or visit their website to get more info. Full kits will be on sale this week at $21.95 once they arrive. let Michelle Kusiar know if you are interested. March 26th all day at Indestri we will be doing the workout Grace and raising money for Epilepsy. We will have baked goods, silent auction items and t-shirts for sale! all proceeds will go to supporting Epilepsy. If you would like a shirt please write your size and name down on the sheet that will be posted at the front desk! we will need these asap as we need to put the order through too make sure they will be ready for the 26th. We are changing the Saturday class to a 7:30pm on spot (working details and will make change for next week) and then we will look at adding a weekend morning class back in the end of spring if the desire is there. The evening classes have been highly attended and yoga has been a hit! Vicki is working hard to bring you the recovery you need and the balance in your life we have been missing. For the extra $5 dollars a month where can you go wrong? Thank you to those who have been bringing in food items for the Friday Night Lights, we will continue to supply beverages (in the fridge) and snacks but if you are looking to help out any potluck items or paleo treats are welcome! There are three different techniques I’m going to address today, and below you can watch a video of each of these being used and see why I prefer to teach the climb with the brake-and-squat technique. You should also climb in pants or long socks to save your legs from rope abuse. I don’t personally care for this method, because as mentioned above, you have to re-wrap the rope around your leg if it’s not feeding through your legs as you climb up. This can lead to extra work. I was taught to use a very simple brake and squat technique that’s extremely fast, makes it easy to reacquire the rope, and will beat any other technique for speed. 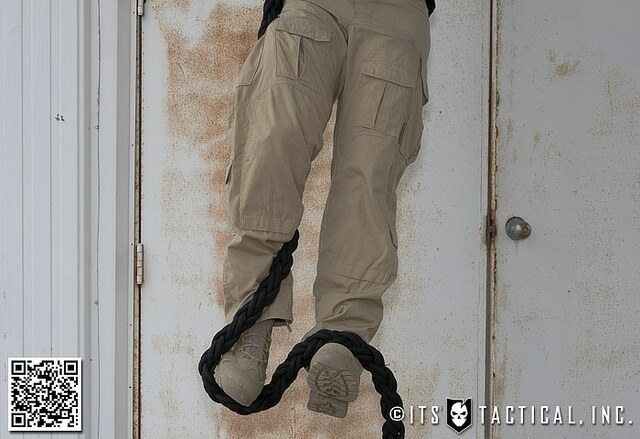 Style & technique: is to jump up to grab the rope high, letting the rope fall on the outside of a leg. 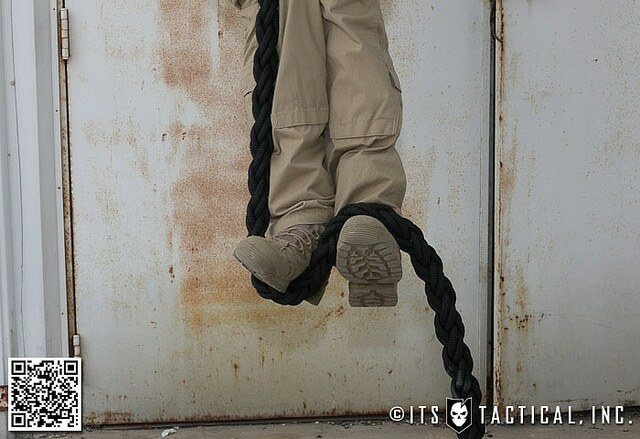 Using the leg that the rope falls to, simply step on it by using the opposite foot to help. 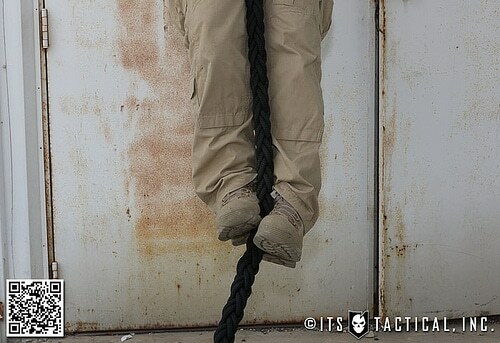 The combination of the rope falling across the top of the opposite foot and stepping on the rope with the other foot will lock the rope in place. BUY IN: Can’t you wait to get outside? FOCUS: I’m like Oprah, always making sure you get what you came for! CASHOUT: Do you love this bike yet? BUY IN: My strength is in my Hair! CASHOUT: Get mobile, and no there’s not an app for that! BUY IN: Death by OHS… Still to fresh? How bout T2B? FOCUS: Have you got your first climb yet? today may be the day! WOD: you think its Funny? well it’s Sotts! GROUP: Crossfit Indestri, Can I put you on hold please? FOCUS: Strength Day! BenchMark Day! CASHOUT: Will you sleep? or just dread all night until you hit 15.3? We will work out technique and strategy and for those who want will hit the wod! Let’s get after this week at Indestri! Note if you can’t make Friday night for judging, please make arrangements with a judge at a different time. Please don’t expect the weekend coaches to score you as they are teaching classes.